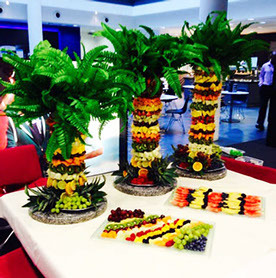 A fruit palm tree will easily become a focal point and talking point for your guests - helping break the ice if you're mixing families! In an increasingly health conscious age - it's a treat you can spoil yourself with and keep your waistline in check! 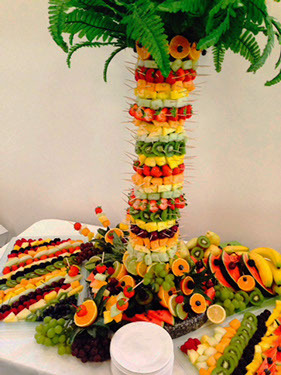 The fruit palm tree holds individually skewered bite sized pieces of fruit which are decoratively arranged. It looks great on its own, or fantastic next to our chocolate fountain. Each palm holds tantalizing individual pieces and all our fruit is delivered and freshly prepared on the day of the event - so you can be assured it will be of the highest quality. Fruit PalmTree prices from £99!